United Yacht Sales New Jersey would love to guide you through a personal showing of this 64' Grand Alaskan Flushdeck 2002. 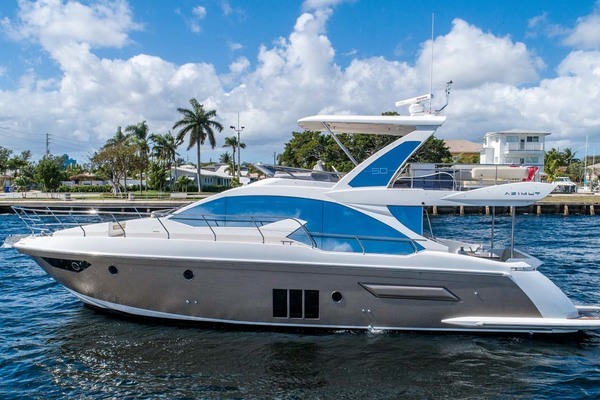 This yacht for sale is located in Fort Lauderdale, Florida and priced at $650,000. For a showing please contact us by filling out the form on this page and we will get back to you shortly! This yacht was built with a hand lay up and solid fiberglass construction to the waterline. She is a flush deck vessel with a cockpit. Starting aft there is an oversized fiberglass swim platform, with easy access through a transom door to a large cockpit with substantial storage below. A flush mounted live well is located with a sea water pump in the cockpit. There are cabinets on the port side, and sink and a Glendinning Cablemaster. There is rod storage accessed from a large cockpit hatch, and cockpit combing for ease of casual fishing. Built in steps on the starboard side lead to a large comfortable aft deck with built in seating, and storage, corian table, and granite covered cabinet with sink. A remote control for the engines and bow and stern thruster (rebuilt in 2010) are stored under the aft deck seating. Gate doors on either side of the aft deck provide additional access and the entire covered walkway area around the yacht has fashion panels that provide safety when underway and adjoin the portuguese bridge. There are additional port and starboard opening gate doors opposite the pilothouse doors. The portuguese bridge opens through a gate door to a large foredeck with double capstan windlass and twin anchoring system with port and starboard anchor lockers.From the aft deck there is a double door entrance through very heavily built doors to a salon with adjoining galley. 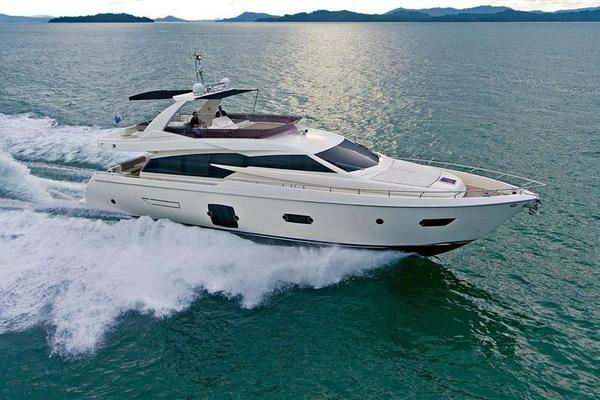 Carpeting, inside the specially built teak floor border, and there are custom window blinds and curtains, additional LED lighting, granite ledges with large teak burl to starboard, and comfortable L- shaped built-in seating with granite topped end table to port. Two additional chairs provide for comfortable dining around a new custom circular hi-lo table. The air conditioning outlets in the salon are on both sides in the valances producing a more effective air flow. There is a private staircase in the salon to access the master stateroom, laundry area and engine room below.The galley adjoins the salon and has a raised bar-style two level granite counter with glass-front display cabinet. In addition, there are cabinets above this counter with LED lighting and extra storage for essentials. The galley is very complete with a new Frigidaire refrigerator/freezer/icemaker, trash compactor, full-size dishwasher, 4-burner GE glass stove top, Advantium oven, double stainless steel sink with garbage disposal, and an easy pass-thru to the pilothouse area. There is a large on-deck day head as well. Just forward of the head is a very large pantry built-in under the staircase. For night-time running, there is an additional door between the pilothouse and galley.Forward is the pilothouse with an L-sectional area offering comfortable seating with a table, overhead LED lighting, and reading lights. Heavily-built watertight doors with teak paneling are both port and starboard. There is a Stidd helm seat appropriately positioned at the navigation station. A custom console was created to maximize space for a very complete electronics package, including a monitor for the camera system, bow and stern thruster, and tank levels. This yacht has been upgraded to twin disc controls in the Fall of 2003. Both 110/220V electrical panels and 12/24V panels are located in this area, along with exceptional storage including chart storage.The master stateroom has a centerline queen berth with very attractive use of burl inserts, custom teak bedposts, and overhead semi-circular custom-designed cabinetry with LED lighting. There are upgraded dimmer switches to control the LED lighting. 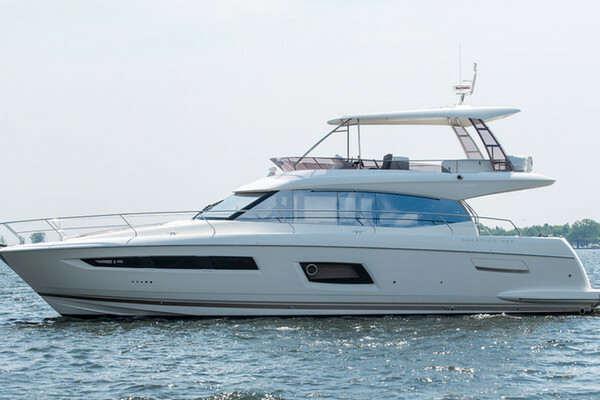 Granite-topped nightstands with pedestal-style columns, flatscreen-style TV/DVD with satellite receiver, stereo system/intercom, glass-front display cabinets both port and starboard, drawer storage and cedar lined hanging lockers both port and starboard. There are opening hatches and also an escape hatch with a hinged teak cover to eliminate light. The master head adjoins this stateroom on the port-side with granite-topped counters, large stall shower, sink and plenty of storage. Forward of the master stateroom, there are full-size high quality Asko washer and dryer on either side of the hallway and additional storage cabinet for supplies.Continuing forward is a walk-in engine room with approximately 7 feet of headroom, custom stainless steel railings around the main engines, and a custom ladder to an escape hatch above. Both generators are housed in this area. Other equipment includes stabilizers, inverter, battery systems, other charger systems, custom work bench, custom tool storage cabinetry, central vacuum system and water pressure systems.The entire area has upgraded insulation on the walls and overhead. In 2005, the owner upgraded the blower and exhaust fan systems for the engine room and added a fuel polisher.From the pilothouse is a private staircase which leads to the VIP stateroom, located amidships and featuring a queen berth with custom headboard, custom teak bedposts, end tables both port and starboard, satellite TV and intercom, large hanging locker, opening drawer cabinets to starboard with framed mirror above, and teak-framed area with drapes which can be opened to provide lighting from the exterior ports. There are upgraded dimmer switches to control the LED lighting. This stateroom features an overhead escape hatch that is cleverly concealed in the headliner and leads to the pilothouse. To port is a large head with granite counters, large shower stall and opening port. Continuing forward is an attractive V-berth stateroom with burl inserts, cabinet storage, large hanging locker, overhead opening hatch, satellite TV and intercom. The enhanced décor includes draperies, housed in custom teak frames both port and starboard in front of the opening ports.A comfortable staircase leads to one of the largest flybridge areas ever found on a 60' to 70' yacht, as it utilizes the entire area above the main cabin house in the traditional style of Burgers and DeFevers. There is a center helm position with electronics, other controls and two Pompanette chairs with covers. There is a large section of built-in seating to port, custom fiberglass storage lockers, and to starboard is a fiberglass cabinet with built-in icemaker, sink and stainless steel barbecue grill with additional storage below. The area furthest aft houses a low-rise 1,000 lb. davit and a new 12' Novurania dinghy with a new fuel injected 40hp Yamaha 4-stroke outboard. After several design changes during the construction of this yacht, the radar arch was hinged and designed to lower and allow a total clearance of 17' 3". This will allow the yacht access to the Great Lakes or Great Circle Route.